On June 2, 2014, the Ladies of Charity (LOC) from St. Benedict the Moor volunteered for the first time to work the Cup of Joe project. Cup of Joe is a breakfast pack program serving the men and women at Catholic Charities’ homeless shelters throughout the Archdiocese of Washington. Kevin O’Brien, Coordinator – Cup of Joe, from Catholic Charities attended one of our District of Columbia LOC quarterly meetings to explain the program and seek volunteers to partner with Catholic Charities in meeting the needs of the homeless in our community. The Ladies at St. Benedict answered the call. 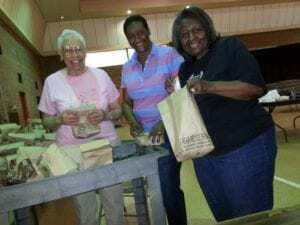 Ms. Odell Allen, President of the LOC at St. Benedict, Evelyn Rattley and Marie O’Neal collectively packed 432 bags filled with breakfast items and delivered them to the Harriet Tubman Women’s Shelter. The Ladies plan to volunteer once a month on this project in partnership with Catholic Charities whose goal is to provide breakfast to every homeless person possible. Also, Sharon Graham, President of the LOC at Holy Comforter/St. Cyprian Church announced their unit’s donation of $1,000.00 to the Cup of Joe project as a result of the proceeds from their annual fundraiser. Each year their LOC group participates in the Saint Mary’s of Landover Hills Car Raffle. This year the ladies decided to partner with Catholic Charities in their efforts to help feed the homeless. Indeed, this money will go a long way in assisting those disenfranchised in our community. Ladies, great job!